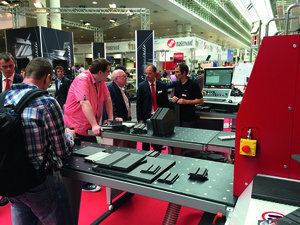 Reports on LIGNA 2015 technology continue at Woodworking Network . We'll continue to add videos, slideshows and stories as they are completed. Automated production for any size plant became a reality at LIGNA 2015. The 96,000 visitors Itouring 1,500 techology and tooling exhibits at last month’s big German show saw a torrent of new developments. Visitors also witnessed equipment running more reliably, and faster and, even more importantly, getting easier to run well. Underlying all of this: the Batch One concept. Batch One plants make cabinetry and furniture one project at a time, to order, using automated work cells. These cells can scale up for volume, or be as compact as a single vertical machining center for a small plant. While Batch One production is the essence of what architectural millworks, custom woodworkers, and furniture makers have always done, LIGNA showed a new generation of automation for these smaller enterprises. And for larger wood productions firms, fully integrated factory lines showed in real-time how Batch One scales nicely, as machining centers hand off work to each other with minimal operator intervention. 1. Human Element Manufacturers are really taking into account a key component in productivity: the woodworker. 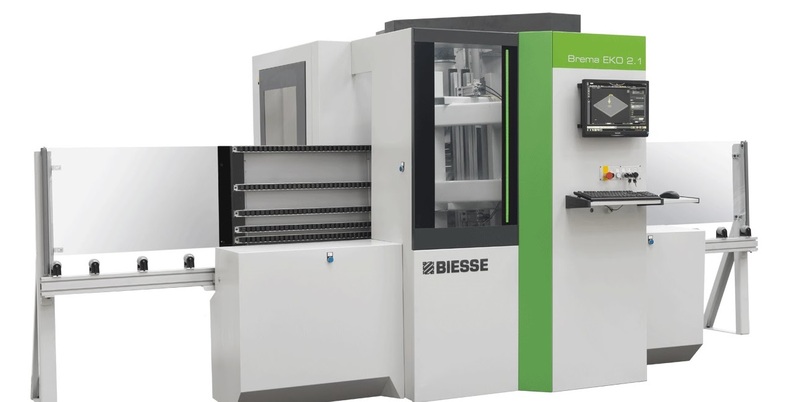 Biesse, for example, showed a rail adjustment on some of its pod and rail CNCs with a handle and locking mechanism that allowed for a big, healthy grip, and easy-to-slide mechanics, and a positive lock/unlock as the rail slid to its location. These same setting functions can also be performed in a fully motorized process. 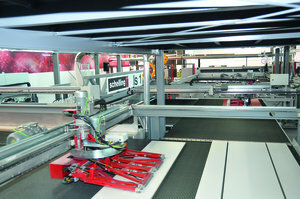 Weinig showed its Powermat 700 moulder with the highest levels of computer numeric control ever, integrated to a digitally enhanced OptiCut profile knife system. But that moulder also had better ergonomics, with a bigger window for viewing operations without and a much deeper case so the operator could really get at all the interior mechanics. Manufacturers overall are also providing more uniformity in control screens, so operators can cross train move comfortably across machines. 2. Wood Industry 4.0 Leading every discussion at LIGNA 2015 was the concept of “Industry 4.0,” a pan-European effort to integrate technology within a machine, across a plant, and throughout the supply chain and the sales process. 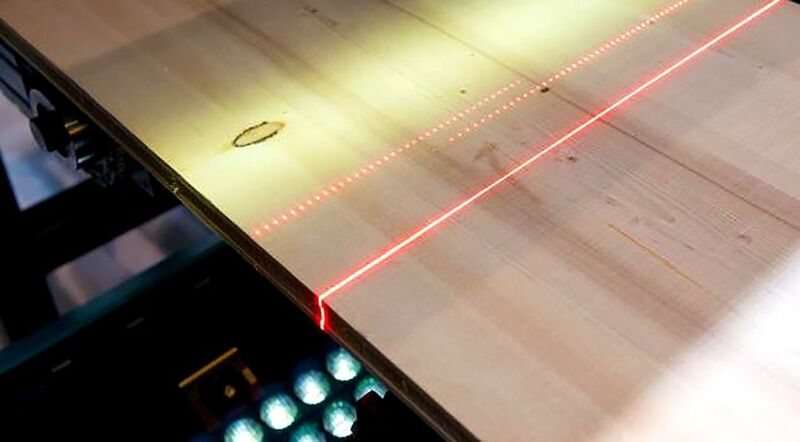 Wood Industry 4.0 could be seen in the smart tooling from Leuco and Leitz — both firms showed cutting tools with chips embedded, for the purpose of communicating with the CNC machine, the operator, and the enterprise-wide computer system. These smart tools, still in beta, transmit data on speeds, wear, tool path, etc. In generating the 3D manufacturing files that will drive the woodworking machinery, wood products manufacturers have discovered they can also render those files as finished very realistic finished products, for use in the sales cycle. 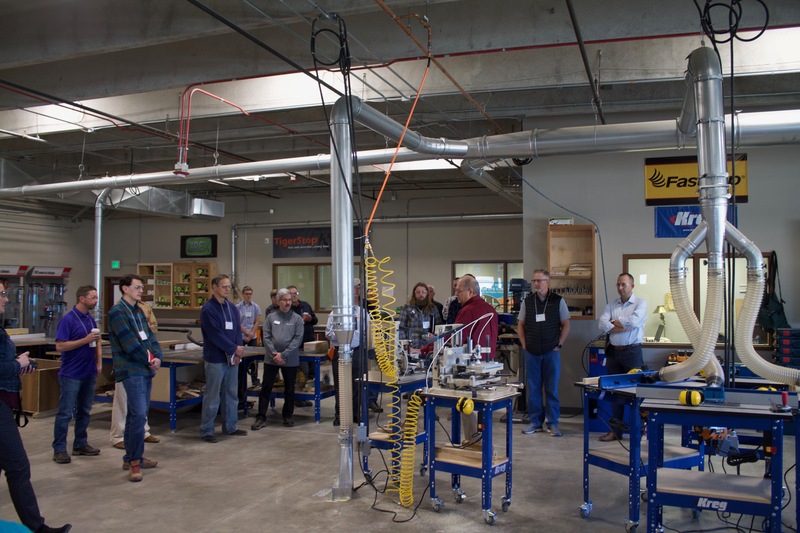 Already in play in CAD/CAM-driven architectural millwork and cabinetry design programs, Wood Industry 4.0 establishes a protocol for reaching into every aspect of production and machine development. 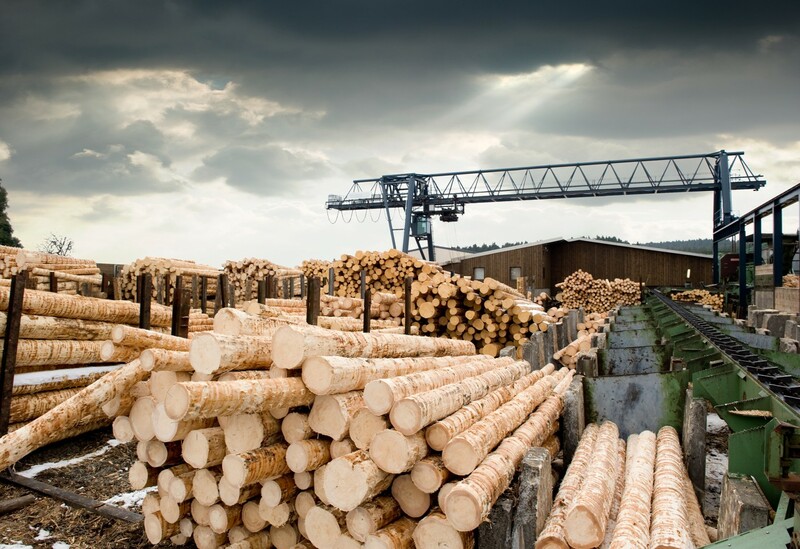 Wood Industry 4.0 and Batch One Production comes to life in the materials handling machinery — robotic lifts, inventory systems, autoload — that feed and offload CNC machining lines. In larger volume plants, a robot tends an accumulation area to stage projects until all components are complete. 4. Vertical Machining Centers Stand Tall Homag started it all with the BHX. Holz-Her also enetered the amrekt and at LIGNA 2015 showed a panel-only version. Biesse and Scm Group both showed their entries in the field. The vertical CNC machining enters embody the concept “in a box.” This lets small shops compete on a more equal footing with big plants. 5. More Human Robots Machinery is now more closely mimicing human behavior. While robots have been readily employed to do the heavy lifting of panel, and offload production, at LIGNA 2015 robots with a more sensitivity - lifting a door, for example, then scanning its barcode, weighing it, and reorienting it for subsequent proceessing. LIGNA 2015 saw Robotic spraying systems that scan unusual or complex shapes, then set spray patterns to reach hard to get places - just as a human would. While new machines may seem costly, the return on investment has never been easier to calculate — especially as markets experience the rising cost of wood and panel. Reviving construction in China and especially the U.S. are taking a big bite out of supply. So squeezing every inch out of a panel or board is more critical — something machines are good at. 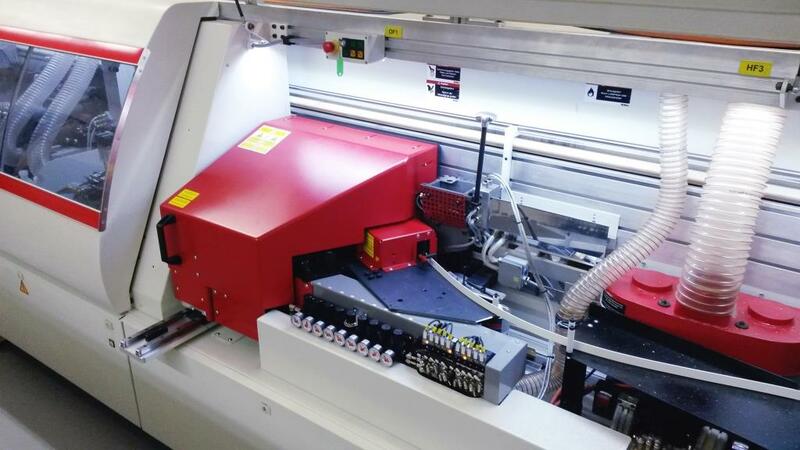 IMA's BIMA Gx50/E/L laser unit hot-melt glue converts to conventional edgebanding.